This movie opens with some disquieting images, from home video footage. A young woman lies on a wood floor, her face horizontal to the lens. She talks about how hard it is to move, and then, keeping the camera with her, she demonstrates her difficulty, crawling and wiggling and undulating. Soon, she and the camera are in a car, and the driver, presumably the woman’s husband, is asking his GPS for “Princeton Hospital,” and the GPS keeps telling him how to get to “Princeton Animal Hospital.” The momentary comic relief of the moment is only slightly mitigated by the question of what kind of people become residents of a town and don’t bother to learn of the location of its various medical facilities some time prior to an actual medical situation. We can get to that later, or maybe not at all. 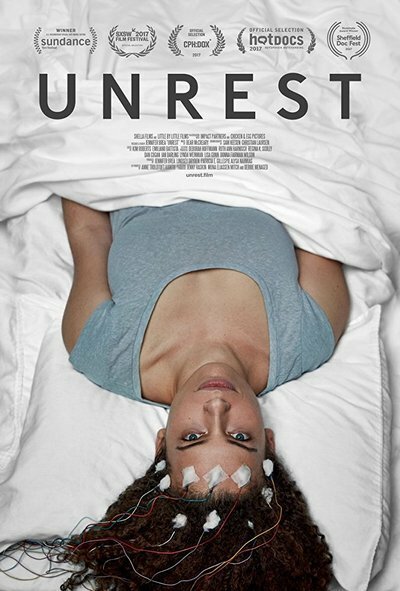 As it happens, “Unrest,” which was directed by Jennifer Brea, the woman in the opening footage, has enough pertinent stuff to say about a little-known and terrifying disease that such nits don’t stick in the mind as the movie ends. At the time that Brea was struck with a fever that left her in enervated pain in its wake, she had been living a storybook life of sort, if being an upper middle class academic is your idea of a storybook life. Looks pretty pleasant from the snatches shown here. After a hellish diagnosis process, she learned that she had ME, that is, myalgic encephalomyelitis, also known as Chronic Fatigue Syndrome. The diagnosis was the beginning of more trouble, because little is understood of the disease, and in our neck of the Western world, it’s not taken at all seriously. An audio clip of Larry King referring to it as “the yuppie virus” and a visual of the ever-helpful Ricky Gervais making a joke about how the disease is also known as “I don’t want to go to work today” illustrate the point in a shameful way. This is why, I think, Brea is so relentless in documenting her own symptoms, which look utterly miserable. Forms of paralysis, an inability to withstand bright light, and more, are what she suffers. The movie opens up to show other victims of the disease. One of them was abandoned by her own damn husband, who was convinced it was psychosomatic. His “come to Jesus” moment happens when he learns one of their adult daughters has gotten ME somehow. There’s worse across the ocean. In Denmark, one sufferer, Karina Hansen, was taken by state authorities from her parents' care and placed in a psychiatric hospital because of an institutionalized “it’s all in her head” belief. This is jaw-dropping stuff, made more profoundly disturbing by the fact that so little is known about the disease—its causes, let alone what can effectively treat it. This information is parceled out in a coherent documentary style that alternates with the story of Brea herself, her struggles with the disease and its treatment. This domestic story is wrenching. Not only has the disease wreaked havoc on Brea’s academic work, it’s cast severe doubt on she and her husband’s ability to start a larger family. Brea’s husband is Omar Wasow, who some of you with long media memories may remember as being a prominent personality on cable news and analysis shows back in the ‘90s. Mr. Wasow was a proselytizer for the new age of digital media and communications, and a rather Panglossian one at that. He’s older and a little grayer now, and still carries himself at times with the aura of a confident talking head. But you can’t help but feel for the guy, and for Brea. However you feel about its messengers, though, “Unrest” is a documentary that serves a vital function. Ricky Gervais notwithstanding, this disease is no joke, and it’s not going to be addressed as the scourge that it is until a larger portion of the population gets that. This movie should help.